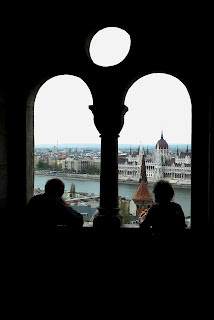 Being geographically challenged, I never knew from minute to minute our first days in Budapest whether we were in Buda or Pest. Turns out everything is in Pest, and Buda is the old city. Terry had to explain it a few times, because the first time he just said the "Castle" was more of a complex than one big building and his explanations continued to expand until he finally described it as being like Mdina. Well if he'd only said that first! We'd been debating the funicular and in the end, standing in front of it, we realized we'd have to pack up the stroller or split up and it wasn't worth the bother. So we walked up the hill. Several times on the way up we questioned that decision too but at that point there was nothing for it but to forge on. We wandered the streets and saw the sights, which Terry will input with their photos as I don't remember the names of the buildings anymore. We definitely got to Fisherman's Bastion and took all the requisite photos from the vantage point. The adorable photos of Terry and Alex come from there, where we hid out during one of the many brief rain showers that day. One pretty hilarious tidbit - the guy who cleans the square in front of the Matthias Church wears courtly attire (well, a tunic and breeches. The photos of him were all out of focus so Terry deleted them.) There was another courtly dressed guy with an eagle, you can see part of him in one photo but the ones that included the eagle were also, apparently, out of focus so they got cut too.